Swings of Beauty. Amazing how similar they are at the point of contact. I sent a video clip of Lefty’s swing to his coach and got some good feedback. He recommended that Lefty get his belly button facing the pitcher after contact. He also noticed that Lefty’s front knee is bent at and following contact which takes away all his power and torque produced by his lower half. He explained the stride leg can go out bent but should straighten as the swing progresses. 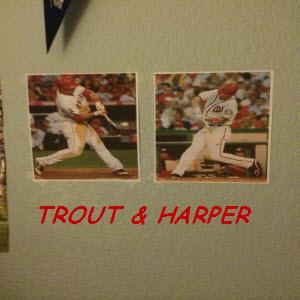 To encourage this approach, I printed out pictures of Lefty’s two favorite players’ swings – Trout and Harper. I was shocked to find the similarity in their swings when placed side by side. I put these photos right over Lefty’s bed hoping for visions of raking to fill his dreams. 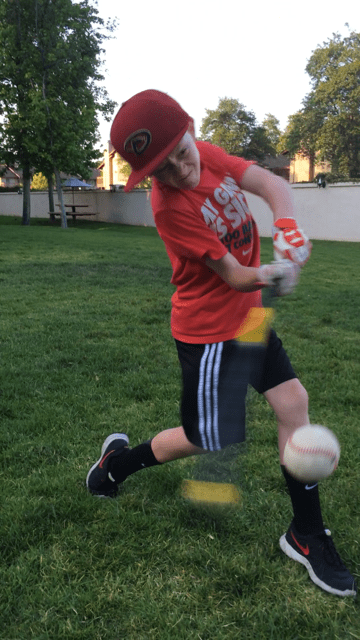 Lefty working on his swing to be like his favs.